Cut into the rock slopes of the remote Mount Gareja, David Gareja is an early Christian group of over 24 Georgian Orthodox cave monasteries founded in the 6th century by David (St. David Garejeli), one of the thirteen Assyrian monks who built monasteries throughout Georgia. The site has been populated for at leat 4000 years as is shown by Bronze Age tombs excavated there. During the Bronze Age Mount Gareja and the surrounding area was forested. During the 1st millennium BC smelting in the region caused trees to be chopped down for fuel and when the monks arrived in the 6th century the area had become the arid semi desert we see today. The monks had to become adept at collecting and storing water in cisterns using small canals cut into areas of smooth rock on Mount Gareja before the monastery could expand. The monks used natural sandstone caves and after building fires inside them to heat the rock they poured cold water onto the hot cave walls which cracked the rock so expanding the size of the caves. Towers were built at each monastery so that signals could be sent between them. 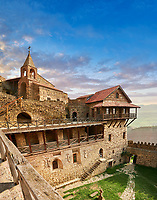 The monastery is spread out over a huge area of the arid Mount Gareja ridge, with small cells and chapels cut into cliff faces, and today part of the monastery is in Azerbaijan. 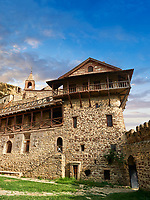 In the 9th century the monastery was further developed by saint Ilarion, and its convent was used to house the female siblings of the Georgian royal and noble families. 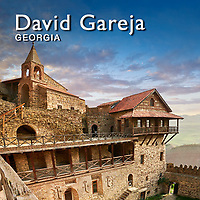 Indeed when 12th-century Georgian king Demetre I abdicated he retired to David Gareja to live out his life as a monk there. In the 11the century a terraced courtyard was built at David Gareja, with new cells, a refectory and a church. Behind this part of the monastery more canals were cut in the long sloping rock face channeling water into cisterns. From here the monks would farm the arid land around and tend their flock of sheep and goats. The heydays of David Gareja were from the 10th until it was sacked by a Mongol army in 1265. The monasteries survived until 1615, when Shah Aggas massacred 6000 monks were massacred during the Easter Night Procession. 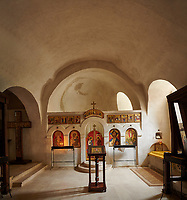 The monastery's unique manuscripts and important works of Georgian art were then destroyed. In 1690 the fortunes of David Gareja were resurrected by Onopre Machutadze when he became father superior of the monastery. The monasteries though slowly declined until they were abandoned in the 19th century. The Soviet occupation of Georgia saw terrible destruction to David Gareja as the area was used to train Soviet troops for Service in Afghanistan, which the area resembles. The buildings of David Gareja were used for target practice until pressure from nationalists finally halted the destruction in 1991. 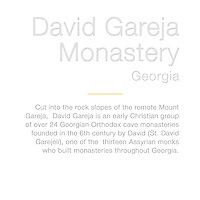 David Gareja is today is again a working monastery. Download pictures & images of David Gareja Georgian Orthodox monastery or buy as photo art prints on line.